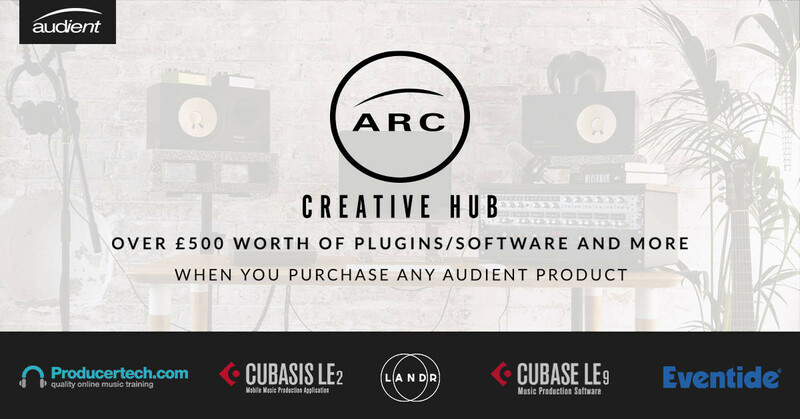 Herriard, UK - Audient has teamed up with some of the industry’s leading innovators, including Eventide, Steinberg, LANDR and Producertech to offer a comprehensive selection of free creative software for all Audient customers, available in the new creative hub, ARC which launches today. As a reward for simply registering a product on the Audient website, new and existing customers are given access to a range of free software designed to provide a solution for recording, mixing, mastering and even education - absolutely free of charge. “The concept behind ARC is not only to add value for our customers, but also to provide high-end software products that producers or musicians of any ability can benefit from on a creative level,” says marketing manager Andy Allen. “As soon as you have registered your product, you can access ARC and download any - or all - of these amazing offers,” he adds. As part of the package, Audient offers two free Eventide plugins: UltraChannel and UltraReverb. Between them, these plugins can provide EQ, compression, delay, gates, reverb and more - all the tools you need at the click of a mouse. Also available are Steinberg’s Cubase LE and Cubasis LE2 (for iOS), which turn a Mac, PC or iPad into a compact Digital Audio Workstation (DAW), offering audio recording, editing, MIDI sequencing and mixing tools for musicians, producers and songwriters. In addition, mastering innovators LANDR are offering 8 free 16-bit WAVs and 2 free 24-bit WAV master credits at no cost to Audient users, whilst the two Producertech.com courses selected by Audient will give unique insights into compression and vocal production, as well as a voucher to put towards further courses. number and click through on the Audient website.” says Andy, encouraging everybody to make the most of this amazing new offer. Read more about each of the offers available to Audient users at ARC online.